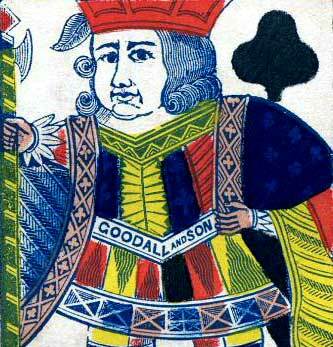 Goodall’s earliest cards, produced using woodblock and stencil techniques, were traditional in appearance but as technology and fashions moved forwards, in around 1845 ‘modernised’ courts were designed. These still contained full-length figures, but double-ended ones were soon to follow. At the same time, the plain white backs were now produced with an all-over pattern of spirals, dots or a simple repeating pattern. 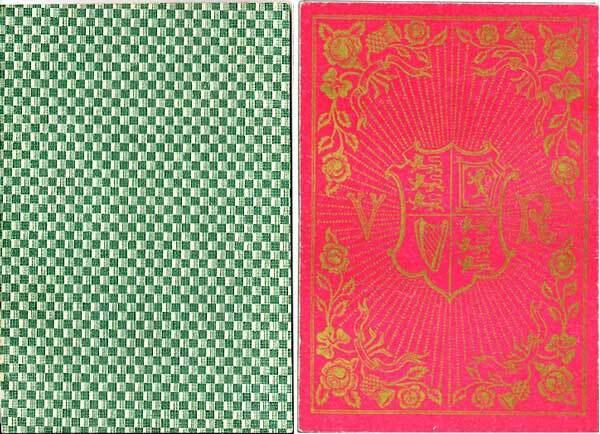 Shortly after this led to pictorial back designs and very soon, in the 1860s, these evolved into multicolour designs, commemorative backs, oriental designs and so on, often including gold on better quality cards. 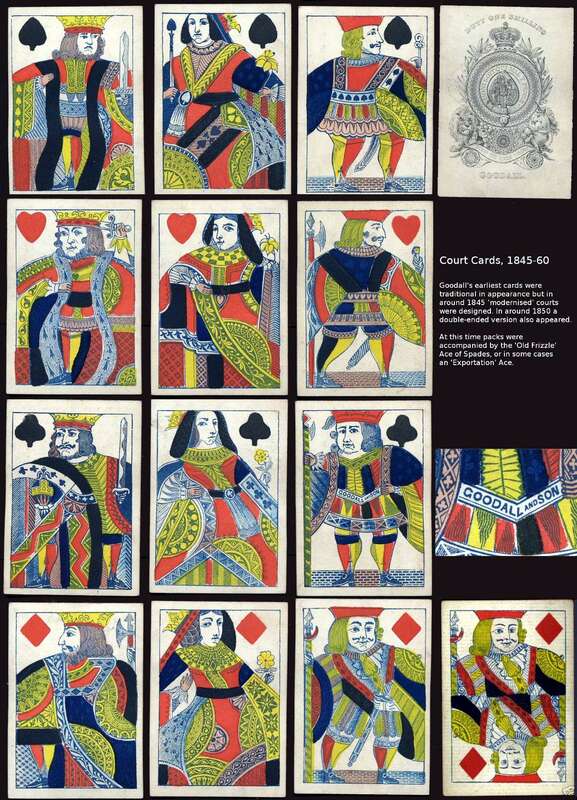 This particular court card design also happens to be the only Goodall deck to carry that name on any court card. At this time packs were accompanied by the ‘Old Frizzle’ duty Ace of Spades, or in some cases an ‘Exportation’ Ace. Above: Goodall's new designs were an attempt to 'modernize' the courts. There was also a double-ended version (1850-60). Two different sets of blocks are known, with various colour variants. 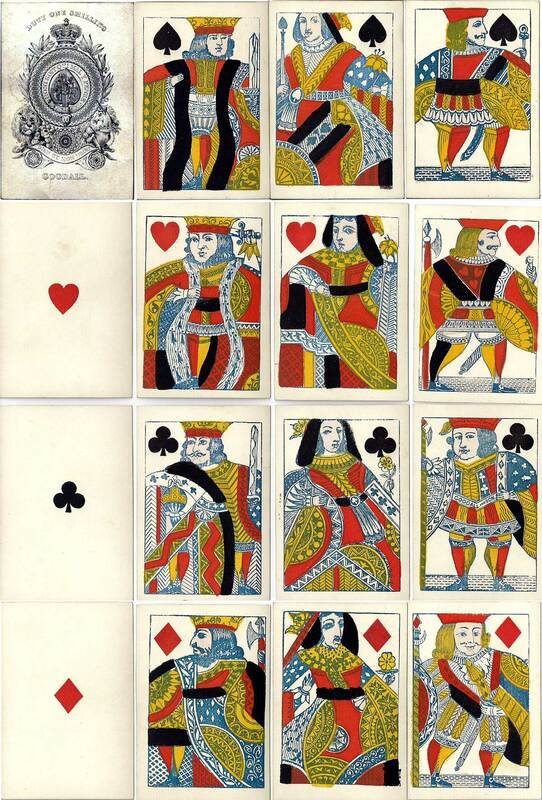 The King of Diamonds has no hand. Shortly after this (c.1860) Goodall made another attempt to 'modernize' the courts, which were re-drawn and decorated in a more ornamental style. These developments were probably to keep in step with De la Rue's innovations. Images courtesy Rod Starling. Right: backs began to be produced with an all-over pattern of spirals, dots or a simple repeating pattern. 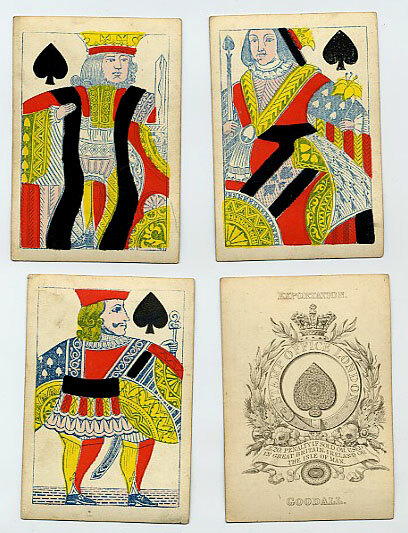 By the 1860s these evolved into multicolour designs, commemorative backs, oriental designs and so on, often including gold on better quality cards. Goodall, Michael H: Chas Goodall & Son: The Family and The Firm 1820-1922, Woking, 2000. This is The best source of information on Charles Goodall & Son.